1449665357 -Organized around the four central themes of healthcare ethics (theoretical foundations and issues for individuals, organizations, and society), Health Care Ethics brings together the insights of a diverse panel of leading experts in the fields of bioethics, long-term care, and health administration, among others. Students will build on this critical platform to develop an extensive toolbox of analytical and problem-solving skills. The text’s organizational strategy gently pushes students to strengthen their ethics knowledge base and relate ethics to patient issues across the lifespan, ethics within organizations, and issues of ethics in broader cultural contexts. Pedagogical features such as section introductions, discussions questions, and exercises that ask students to apply new knowledge to real-world scenarios encourage retention and skill building. The fully revised and updated third edition addresses current changes in health care, which are the greatest changes in health care history since the advent of Medicare and Medicaid. All-new chapters cover the Affordable Care Act and ethics issues related to populations not covered by the Act, ethics related to assisted living, and the impact of technology on ethics in health care. All other chapters have been updated to reflect the most recent developments in medical technology and new challenges faced by health care professionals in the post–PPACA era. 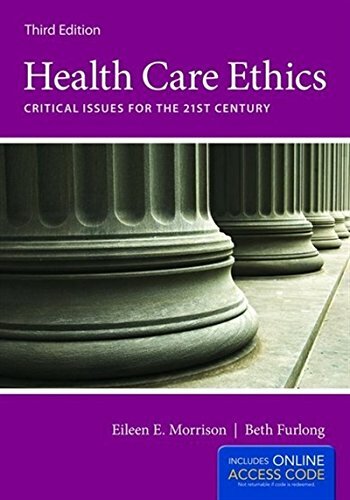 Ideally suited for both graduate and undergraduate programs, Health Care Ethics challenges readers to think beyond the existing health care system and envision creative solutions to ethical issues.